The Cobb at Lyme Regis in Dorset is an old stone curved pier forming a large harbour. Some 870ft in length there is an appreciable slope to the upper section with a sheer drop on one side into the sea. The lower promenade on the harbour side is better protected from the elements, but far less spectacular. On the horizon are the dramatic cliffs of the Jurassic Coast but I would advise stopping to take in the view. There is a notice informing anyone who wishes to walk along The Cobb not to do so in high winds. It’s easy to see why. Even on a clam day walking along the slope of The Cobb can be a little unnerving. This location was of course made famous in the 1981 film ‘ A French Lieutenant’s Woman’ featuring Meryl Streep. 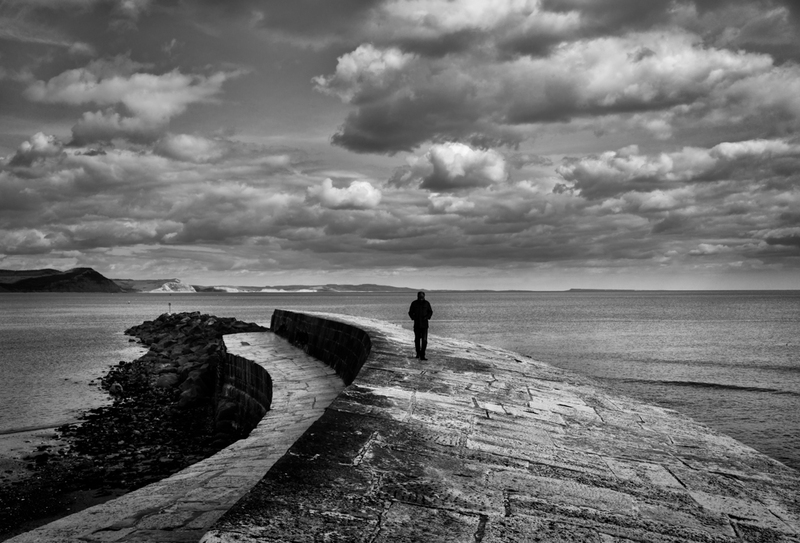 A popular and much photographed scene, the inclusion of a lone figure walking on The Cobb not only adds human interest but also raises questions in my mind. It’s an image of solitude, coupled with the drama of truly spectacular location. The Cobb’s slope is clearly visible and the sea is clam. What are the thoughts going through the mind of the person in the picture? Is he enjoying an inner calm and peace or are his feelings of a very different nature? Perhaps he is simply enjoying the wonderful view on a beautiful Spring day? Questions but no answers, but hopefully an image which can be appreciated for a variety of different reasons. Barn roof – just when I thought I had finished. Wonderful photo, Alan. I’ve only visited this spot once but didn’t get a chance to photograph it. I did get into trouble with the dog warden though, for not having my dog on a lead! Thanks Simon. It’s a great place and we were good….. and kept our dog on the lead!! Thanks Andy. I was fortunate with the figure. There were quite a few people around that afternoon. Gorgeous. Love the lines and the high contrast. Thank you. And thanks for following too.